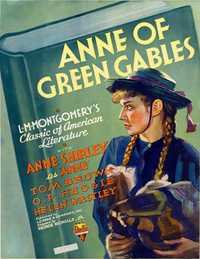 Anne of Green Gables is a 1934 film directed by George Nicholls, Jr., based upon the novel, Anne of Green Gables by Lucy Maud Montgomery. The actress Dawn O'Day who portrayed the title character of Anne Shirley changed her stage name to Anne Shirley after making this film. This modest film became a surprise hit in 1934, easily succeeding in becoming one of four top-grossing films RKO made that year (as noted in The R.K.O. Story published by Arlington House). • 'The West Wing' star Martin Sheen on Donald Trump presidency: "Please, God, no"
This webpage uses material from the Wikipedia article "Anne_of_Green_Gables_%281934_film%29" and is licensed under the GNU Free Documentation License. Reality TV World is not responsible for any errors or omissions the Wikipedia article may contain.